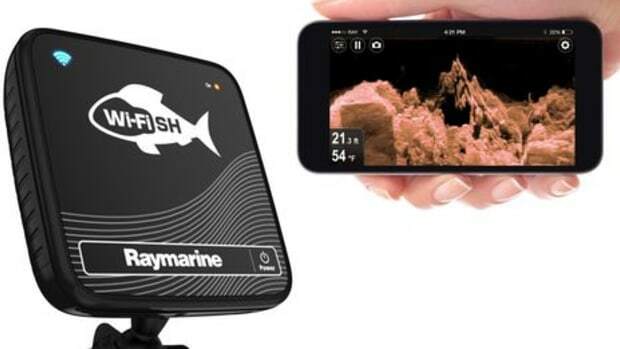 Last Monday Flir unveiled Raymarine's eS Series. A cynic might say that the eS Series is simply a refresh of the existing eSeries but I would beg to differ. 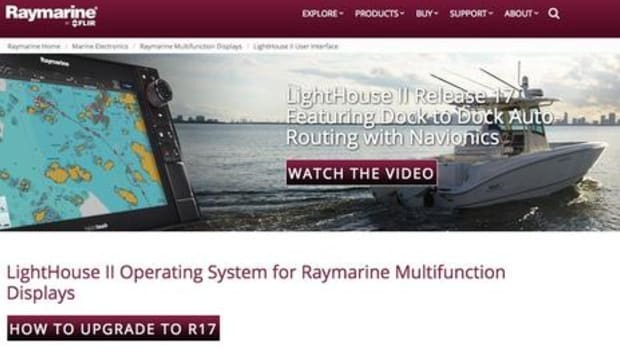 Last Monday Flir unveiled Raymarine&apos;s eS Series, and shortly thereafter, extensive detail on the new 7-, 9-, and 12-inch multifunction displays went online. 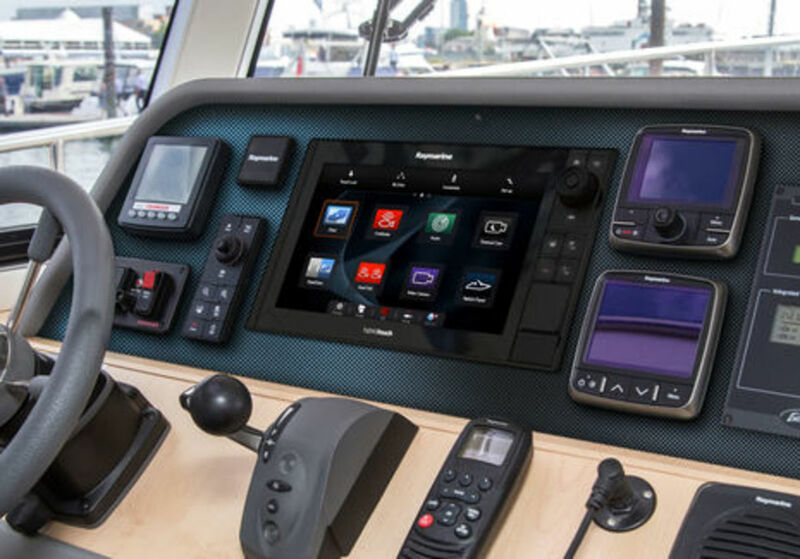 A cynic might say that the eS Series is simply a refresh of the existing eSeries with its similar HybridTouch mix of keypad and touchscreen controls. But that would ignore multiple hardware improvements plus the amazing evolution of Ray&apos;s Lighthouse II operating software since the lower-case "e" MFDs entered the market in 2011. 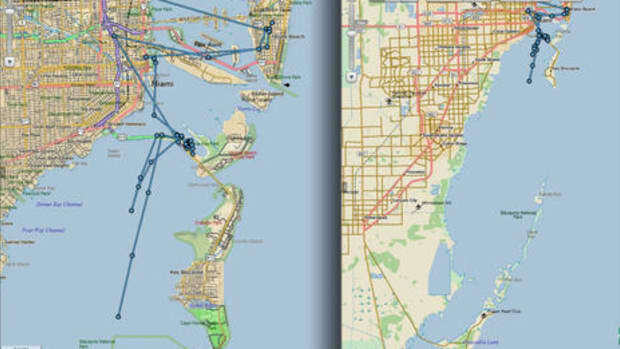 For instance, click the photo above bigger (here) to better see the full support for Navionics, C-Map, and LightHouse cartography (discussed here recently). Also, not to be ignored is the glass bridge style, which makes sense in all its ramifications and is very much here to stay, I think. 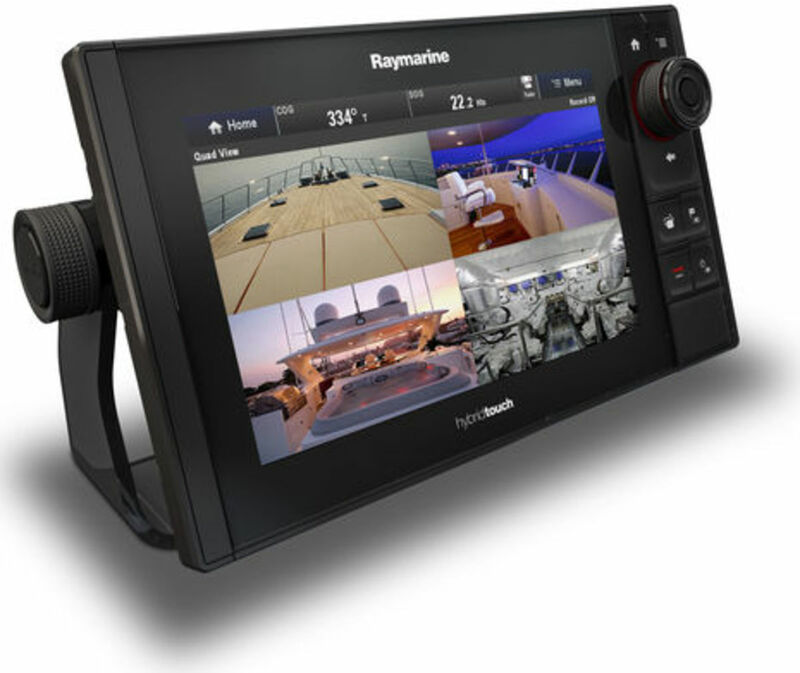 This eS Series photo highlights the extensive IP (and analog) camera support that came to Lighthouse II last fall, as many as 10 IP cameras, according to the detailed specifications table. You can also see the new eS knob/joystick design, which is described as a "multifunction rotary controller" that "offers precise menu and cursor control." Note how the design is neatly echoed in the bracket knobs. In fact, this may be the sharpest looking bracket mount I&apos;ve seen, though glass bridge styling always seems to cry out for panel or even flush panel mounting, both of which are also possible. Doesn&apos;t the panel mounted eS12 above look right? 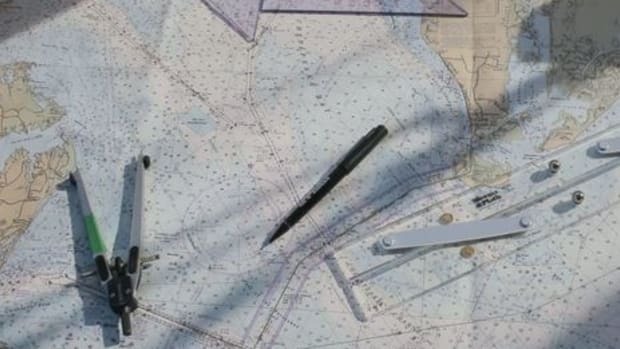 What really struck me about this photo, though, is the jumble of styles, which is still pretty much the norm on even many new boats. Maybe I&apos;m getting jaded, but the ST70 and AP70, which seemed quite handsome a few years ago, now look a bit clunky. 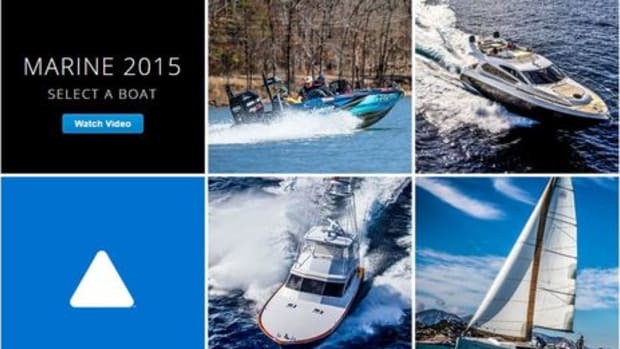 Dare we predict new Raymarine instruments and autopilot controls that are blacker, flatter, squarer, and mostly glass surfaced? Many of the manufacturers are moving in that direction and I think it&apos;s great. Note, for instance, how even displays from multiple manufacturers blend together on Gizmo&apos;s fly bridge (as seen in the new header photo and in more detail here). There&apos;s a practical side to the glass bridge style, too. Touch control is easier, especially when command buttons are at the edge of the screen, if the display&apos;s surface stays flat as it extends beyond the screen. But in my view "glass bridge" is more than a style, its advent inextricably mixed up with the trend toward MFDs that include ever more functions. 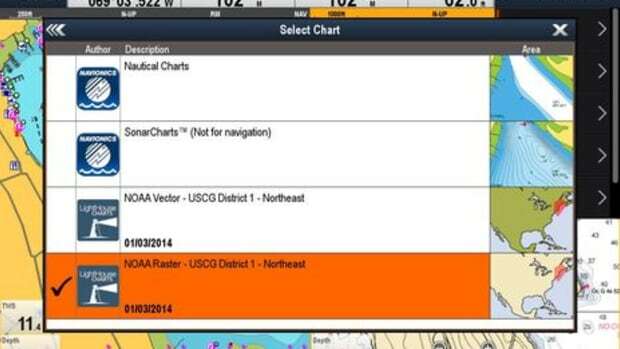 The eS above, for instance, is displaying 3 types of sonar, some of which may be built into the unit, and that&apos;s not unusual in this "glass" age. 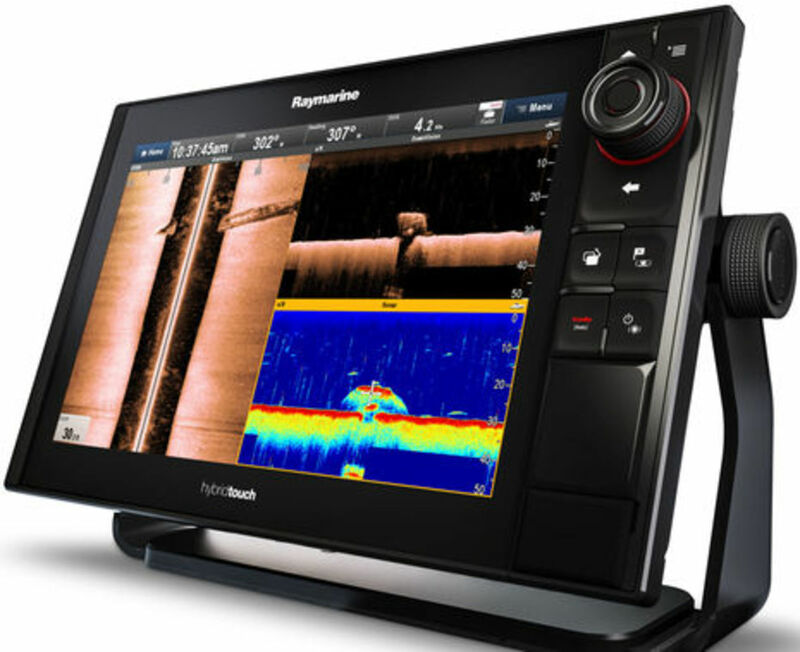 There were actually 7 eS models introduced, as each of the three sizes has an eSx7 version with 600W ClearPulse 50/200 kHz sonar built in and an eSx8 version with the CHIRP/DownVision sonar that uses Ray&apos;s combo transducer. The 7th model is the eS75, which has no sonar but does sport an aggressive $1,100 retail price. 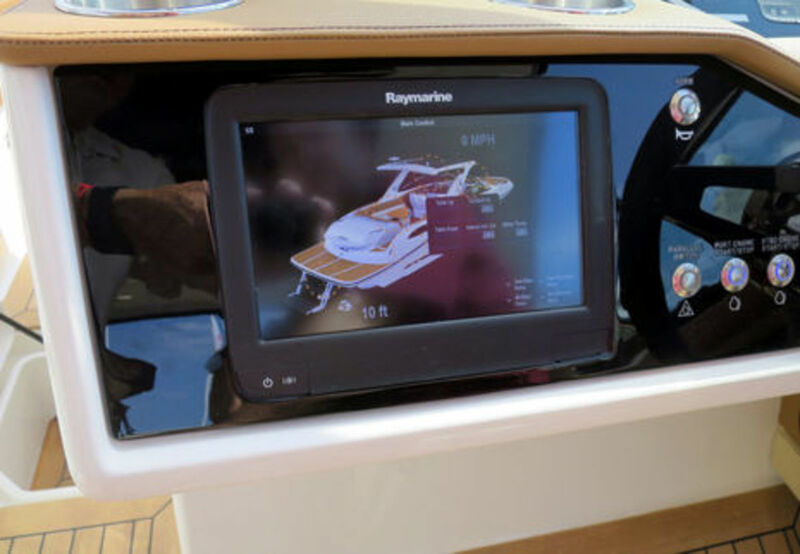 Raymarine is also being more aggressive about its support of (Empirbus) digital switching technology, which is so complementary to the sleek, highly integrated black glass helm concept. The photo above reminded me of a "test of concept" I saw last fall in Fort Lauderdale. 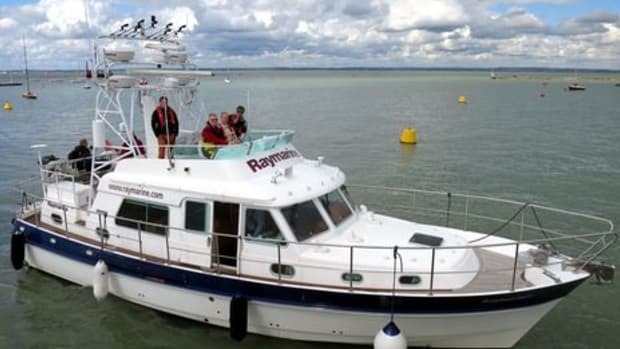 As I understand it, this particular Sea Ray is not in production (yet) but it did neatly illustrate how Ray/Empirbus digital switching could turn some complicated helm controls into something easy and even fun. 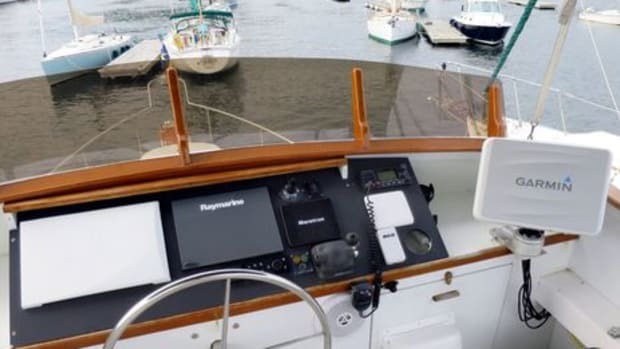 Sorry for my poor photo, but if you click it bigger you&apos;ll get a sense of how lighting, cockpit table height, tender lift and more are touch controlled. The moving parts are even usefully animated on screen, and note how few physical switches are left to clutter the dash. Plus, it&apos;s telling that someone painted the silver bezel of that Ray a12 black. An eS12 will obviously work better in that spot, and eventually, an all-touch aS Series also seems obvious. 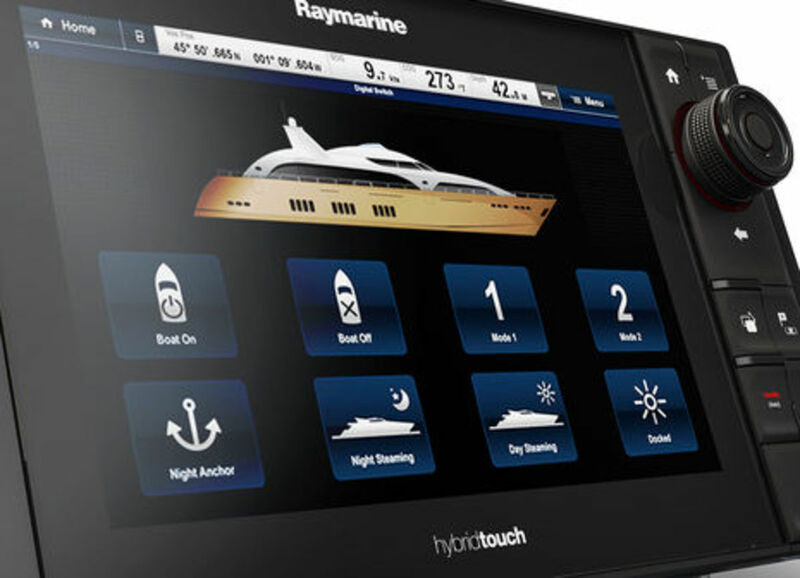 Personally, though, I like hybrid touch/knob glass bridge designs if you can reach the MFD easily -- and remote keypads like the RMK-9 when you can&apos;t -- and I&apos;m particularly looking forward to trying Ray&apos;s new controller (which may happen soon). 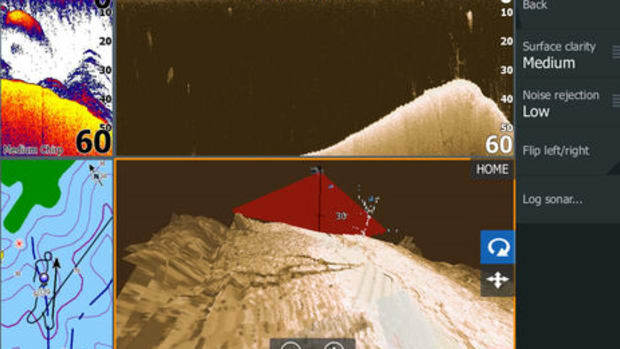 Even the current eSeries (and RMK-9) controller seems slightly more useful than Simrad&apos;s NSS evo2 knob -- because it can manage the cursor as well as menus and volume/gain type functions -- so how did they improve it? 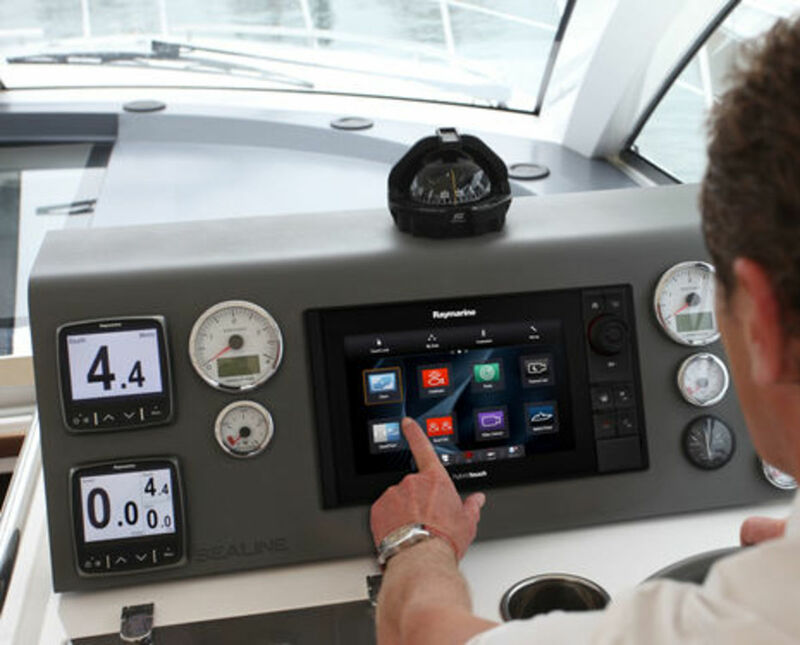 The bigger picture, though, is Raymarine endorsing the glass bridge style even for smaller MFDs (than the gS Series). 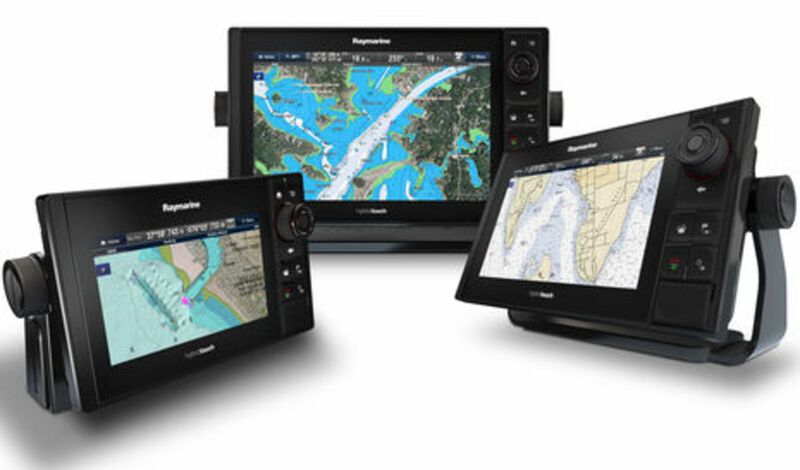 Consider the eS along with the recently introduced Garmin 7600 Series and Furuno TZTouch2, and suddenly Simrad NSS evo2 has a lot of company. And while I may lack imagination, I can&apos;t picture the glass bridge style fading quickly. In fact, I think helms like the one below will just get glassier. It&apos;s like wearing black clothes in New York City; it&apos;s just worked for a long time, and there&apos;s no sign it will stop working anytime soon.